I am a new patient of Dr. Narayanan after having the same dentist for 30 years and she is fabulous! LaurieP. I am a new patient of Dr. Narayanan after having the same dentist for 30 years and she is fabulous! Laurie P.
Ramya is a very competent and accomplished professional. Her diagnosis and accurate treatment helped me get quick relieffrom my pain. Her quick turnaround at short notice was a very appreciable gesture. I would highly recommend her to my friends. Ramya is a very competent and accomplished professional. Her diagnosis and accurate treatment helped me get quick relief from my pain. Her quick turnaround at short notice was a veryappreciable gesture. I would highly recommend her to my friends. Please Advise: If you found us through Groupon, please call the number provided. As the owner and Dental Director of Strong Roots Dental, Ramya Narayanan DDS earned her Doctor of Dental Surgery at the prestigious New York University College of Dentistry. Following graduation, she joined a reputed dental practice in Union, NJ. She joined as an associate and worked her way up to being the Dental Director, where she currently works in collaboration with a Maxillofacial Surgeon, Periodontist and an Orthodontist. Residing in Jersey City, Dr. Ramya Narayanan always wanted to give back to her community. So she started a private practice in Jersey City, NJ named.. "Strong Roots Dental". Here she oversees a General Dentist and a Periodontist who offer a wide variety of services including general, cosmetic, periodontal and implant services. 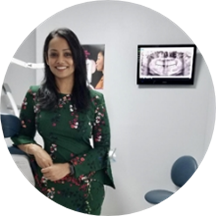 With over 5 years of experience in a private setting, Dr. Ramya Narayanan's enthusiastic personality and kind manner is a perfect compliment to any patient's dental needs. She is not only a skilled professional but also her love for dentistry and care for her patient's is evident from the moment you meet her. Dr Cohen went well and I would have no problem going to him in the future. Dr Ramya gave me multiple suggestions regarding my trouble which was very helpful. I am glad I did end up taking her suggestion. No better feeling to be out of tooth ache. Thank you! The best dentist in hudson county. I highly recommend their services. I have a very sensitive mouth, and not once have I felt any pain.. I can’t say enough good things about the staff. They are funny, service minded, and always pleasant. Dr. Ramya is very knowledgeable and skilled. I hardly feel any pain even with the injection or during procedures and have never had issues with any of the work I have got done here over the past 3 years. The dentaloffice is very clean, staff is friendly and wait till time is minimal. Highly recommend. Bad service. The doc spent all of one minute with me. She did not give any clear answers and showed no compassion. Total rip off. Very pleased with Dr Narayanan and her staff, they took great care of me and listened and worked well to alleviate my anxiety about dental work. I would highly recommend this office and staff, and intend to use her for allfuture dental work. I cannot thank her and her staff enough, they were incredibly accommodating. Sub 5 minute wait time before I was seen. Great visit in response to my request for x-rays after an accident to my face. Both dentists who saw me were exceptional in the care they took to examine me and the explanations they gave of my condition. Thanks to them both and to all in the office. Dr. Ramya is a sweetheart! She is very caring and does a nice job! She was great! I was very nervous and anxious about the visit because it had been a while since I had gone. The staff was so helpful and the assistants were great! I've always loved visiting this dentist. Despite others being much closer to my house, I stay with her as she listens when I say something is sensative as opposed to just poking and causing pain. Dr. Dave,oral surgeon, was pleasant, efficient and effective. It was great. I only wish that I were told about the additional charges prior to my appointment instead of when I just got there. Dr. Ramya is knowledgeable, kind and courteous. Her clinic is very neatly and professionally set up. Dr. Ramya was great! Highly recommend. Awesome dentist who takes care to explain things clearly and make you feel comfortable. Highly recommend. Dr Ramya is the best dentist in Jersey City!. The office staff is friendly, and professional. If you're looking for a new dentist that takes personal care of each and every patient, please give them a call. What a fantastic experience. Incredibly convenient location; great space; zero wait; helpful and friendly staff; and Dr. Narayanan provided the most thorough and comprehensive exam and cleaning I've ever received. Cannot recommend this practice more highly! Really fantastic - highly recommend. Didn't mind the wait at all (wasn't long and the staff was informative, helpful, and friendly). Took my 8 year old daughter for a cleaning/exam. Great experience in the new dental office. Very nice setup and convenient location. Dr Ramya and team are superb. New office location & setup for clinic is awesome. Great service from the staff as usual & Dr. Ramya is wonderful. She was great! Very professional, knowledgeable and friendly. She took all my concerns seriously and treated me respectfully. I liked her a lot. She has great bedside manner and is very thoughtful. She mindfully explains what is going on and afterwards, my teeth felt amazing. Another visit with Dr. N, this time for a deep tooth cleansing -- who would have thought this procedure would be a mostly pleasant experience. Thanks so much Dr. N!! Good job. She was gentle and thorough. It was a very good experince. I've been to many dentists, because I usually don't like them. Friendly, personable, does her job. No pressure to get multiple treatments. Very easy to work with. Stopped going because I work in Manhattan and timing is never good, otherwise, I would see her again. Thank you. I get my teeth cleaned regularly (twice per year) and have not had any major dental issues. This dentist rushed the appointment, probably had her hands in my mouth "cleaning" for a maximum of 5 minutes. No polishing of the teeth.Limited hands on time. I went to her last minute because I wanted to use my dental benefit before the end of the year. She did tell me I had good oral hygiene, but that doesn't not excuse the lack of a true cleaning. I would not recommend her and I have discouraged others from visiting her practice. She's great. If you are a dental-phobe, give her a call. Good dentist with personable interaction. Absolutely fantastic! I don't particularly enjoy dentist visits, but I'm so happy to have found such a great doctor and office staff. Didn't wait long at all, staff was attentive and courteous, Dr. Narayanan was very kind and informative and was thorough in narrating all the work she did throughout my cleaning. FYI they are changing locations soon. I'll be back! This office, meaning the physical space, was awful. To have your teeth cleaned in a place where the walls aren't properly painted, signage is spelled incorrectly, and felt overall dirty was really an uncomfortable experience. Everyone was really nice, but truly the environment was horrible. Once again I am in love with this office. It is quick and easy and after the renovations much, much nicer. All three visits have been me walking in, checking in, being greeted, being cleaned, being reminded to floss more andthen me leaving just as happy as I came in. It's an excellent deal and an excellent place and location. Couldn't be happier.